Why, Mr Cameron, are these men still free? Why, Mr Cameron, are these men still free? Both fail your 'radical Islamist' tests in spades on a whole range of factors, not least their refusal to condemn unequivocally Islamist violence. 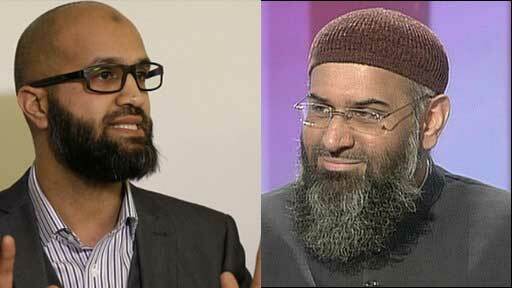 Both should now be in Belmarsh in solitary cells, awaiting trial, forbidden from inciting convicted Islamists already imprisoned here. So why, please, are they still free to spread their hate and Sedition? The numbers are still coming in, but it seems that Brits and Germans may form the majority of the victims of the Tunisian Islamist dogs. If ever confirmation were needed that we are at war with radical Islamists, this must be it. I'm afraid that there is only one solution for members of a fanatical cult so careless of human life - and that is to eliminate them like vermin. However, it's also the aim of the Islamist dogs to foment religious war even with those who can pass the Prime Minister's Islamist Test (below) - so a general violent reaction against Moslems in the UK is certainly not the answer. Incidentally, I saw my first Islamic face-veil in Klagenfurt in southern Austria this week. Normally Austria is fairly hostile territory for Moslem migrants, so it was fairly brave of this young woman to endure the frankly unfriendly stares she was attracting. As we passed eachother I did without thinking what is ingrained in me to do always in this part of Europe; make eye contact, and give an eye-smile with the greeting "Grüß Gott!" before the hostility in her own eyes showed clearly how unwelcome this traditional Christian greeting was. Well, tough. If she wants a society in which the people are now afraid to say 'Bless You!" to a Moslem sneezer she needs to move to the UK. The Austrians will keep their obligatory greeting and good luck to them. "Who's this bloke, then?" my colleague asked "Has he taken over from the other bloke?" He was referring to (respectively) Martin Schultz, an MEP who is styled President of the European Parliament after receiving the votes of his fellow MEPs, and JC Juncker, an unelected official styled President of the European Commission. No, No, I explained; Europe had scores of unknown, unelected non-entities styled President of this or that. In fact, I said, there had been twenty-seven previous EP Presidents during the reign of our Sovereign Lady not one of whom could be named by anyone in the UK, including the Brit who held the title between 1987 and 1989. MEPs in the UK occupy a social niche somewhere between county councillors and golf club managers. They are the last resort of journalists desperate for a quote and not one Londoner I've ever met can name a single MEP for our capital city. More Brits know when National Breastfeeding Day falls than can pinpoint Europe Day. The EU is a subject so mind-numbingly tedious that rational Britons have gnawed off their own hands rather than hear QMV explained. People aren't just uninterested in discussing the EU, they are negatively interested; their degree of uninterest passes zero on the scale and continues into the minus numbers. None of which means that we don't care about the power wielded by that amorphous, grey, unelected and undemocratic officious mass in Brussels. We may not be able to identify or differentiate them, or tell what they do individually, or understand the pompous titles and spurious offices with which they reward each-other, but by Golly we don't want to give up our own democratic power to them. They may be fine running places such as Luxembourg or Belgium, countries that don't matter, but you wouldn't trust them with the UK, would you? Unfortunately, Brussels is filled with folk like Mr Schultz MEP deluded enough to believe this is exactly what we Britons need. And the matter is getting loud enough to penetrate even to those such as my colleague. Today my hopes and wishes are all with the people of Greece. Not innocents, but more sinned against than sinning. Something of the reality of those inflated Greek pensions is the example of a 64 year old grandfather getting 750€ a month, and supporting a wife, workless married children and grandchildren from it. For sure there is barter, work in the black economy and the network of semi-legal mutual support structures but some things - utilities, rent - must be paid in real cash. Would you take it from him? I don't think I could. but he turned it down without the slightest hesitation. a reasonably educated young man, twenty-five years old. He won two, maybe three dollars a day—sometimes. however cleverly he played, however stupid the opponents he chose? His borrowing—that was even worse. and sometimes he had to come down to even less. he’d cool himself at the baths, and with a morning swim. His clothes were a terrible mess. a very faded cinnamon-brown suit. the cinnamon-brown suit was tastefully excluded. from his morning nakedness at the baths and on the beach.